A debut novel about one girl’s remarkable journey across France during WWI. France 1916. Angélique Lacroix is haymaking when the postman delivers the news: her father is dead, killed on a distant battlefield. She makes herself a promise: the farm will remain exactly the same until her beloved older brother comes home from the Front. But a storm ruins the harvest, her mother falls ill and then the requisition appears… In a last-ditch attempt to save the farm from bankruptcy, Angélique embarks on a journey across France with her brother’s flock of magnificent Toulouse geese. Delighted to read and review the debut novel from my fellow Golden Egg Academy trained editior, Rowena House. Before you even open it, the biplanes and ragged soldiers on the cover set it firmly in WWI. 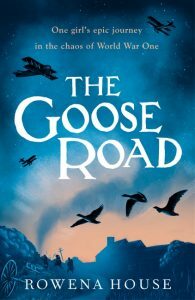 The balance of dark and light beautifully reflects changes of tone throughout novel and the beauty of the geese is central to story, of course. Leo Nickolls has done a lovely job with the lettering too. The Goose Road is not a technically difficult read, but the publishers’ recommendation for older readers is appropriate. Whilst historically honest, it’s far from unrelentingly grim – but some younger or more sensitive readers may find some scenes distressing. The journey itself, with all its difficulties and encounters, runs parallel with the growth in Angelique’s character. Already likeable from our earliest meeting, Angelique takes us from the hardships of early 20th century French peasant life to the edge of war. Along the way we find friendship, humour, moments of poetic natural beauty and bashful romance. There is also deceit, betrayal and loss. Meticulously researched, the story plays in the cinema of your imagination like a lush historical epic – but with a teenager in close-up. Highly recommended for *any* fairly experienced reader who wants a wartime adventure with a courage at its core. I’m trying so hard not to give spoilers! This entry was posted in Review and tagged #writersreviews, Golden Egg Academy, Rowena House, The Goose Road by KMLockwood. Bookmark the permalink.